As angry voters divided the spoils between a number of parties with hugely different ideologies, forming a government has proved impossible. ANOTHER ELECTION WILL likely be held in Greece as talks to form a coalition government have so far failed to yield any results. The country’s left-of-centre parties began negotiations yesterday but New Democracy leader Antonis Samaras has already conceded that his party will not be able to come to a tenable arrangement with the anti-bailout group Syriza. It now falls to the leader of Sryiza, the anti-austerity bloc which gained 52 seats (the second largest share) in Sunday’s general election, to stitch together a coalition. Although BBC News reports that its leader Alexis Tsipras will meet with both New Democracy officials and outgoing ruling party Socialist Pasok later today, there is little hope that a deal will be reached. 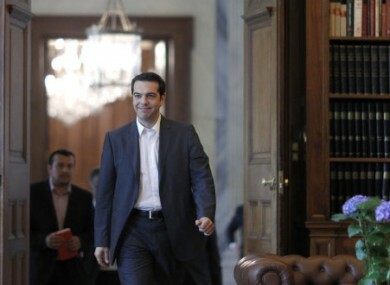 Syriza has said it will only form a government if the austere terms of the bailout package are ripped up. As both mainstream parties Pasok and New Democracy are described as pro-bailout, commenters have said it is unlikely a coalition will be successfully put together within the three day window. If no government is formed, the next tranche of the IMF rescue package could be withheld, forcing a default and possible exit from the euro. As the 300 parliament seats were split between such a wide range of parties with no one group obtaining any sort of controlling power, the country teeters on the brink of political chaos. Assuming that no coalition can be formed, a second general election will then be held next month. Markets continue to be spooked by the uncertainty in the eurozone with Asian stock falling this morning. Email “Greece faces second General Election as coalition hopes fade”. Feedback on “Greece faces second General Election as coalition hopes fade”.